What’s Your Big Bliss Picture? 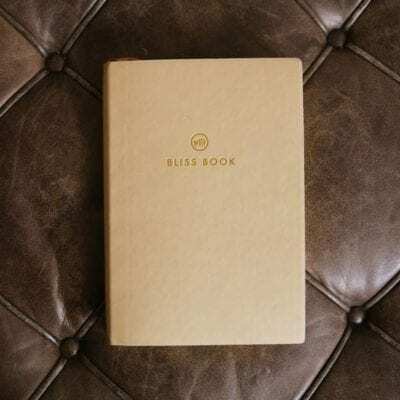 My Bliss Book is an evergreen daily planner with a full year online coaching system which uses backward planning and creative visualization to help you realize and achieve your Big Bliss Picture and all your goals along the way. The planner includes a link to join an email list which sends bi-weekly emails with meditations, tips, and personal challenges to help you stay on track all year long. Your first email comes with a downloadable Big Bliss Picture meditation. Once you know your true bliss state and all that it encompasses, you will work backward from there to your next most important step and everything in between. Most people’s ultimate bliss is about 10 years away so don’t worry if you’re thinking you’re going to need more than one planner! The planner will focus on your first-year goals, making sure they are always in line with your personal Big Bliss Picture. Crushing goals is better together. Invite a friend to join in this journey with you.